Merry almost Christmas! Steve and I just got back from a quick trip to NYC. There's nothing like it this time of year and it definitely put me even more in the spirit! 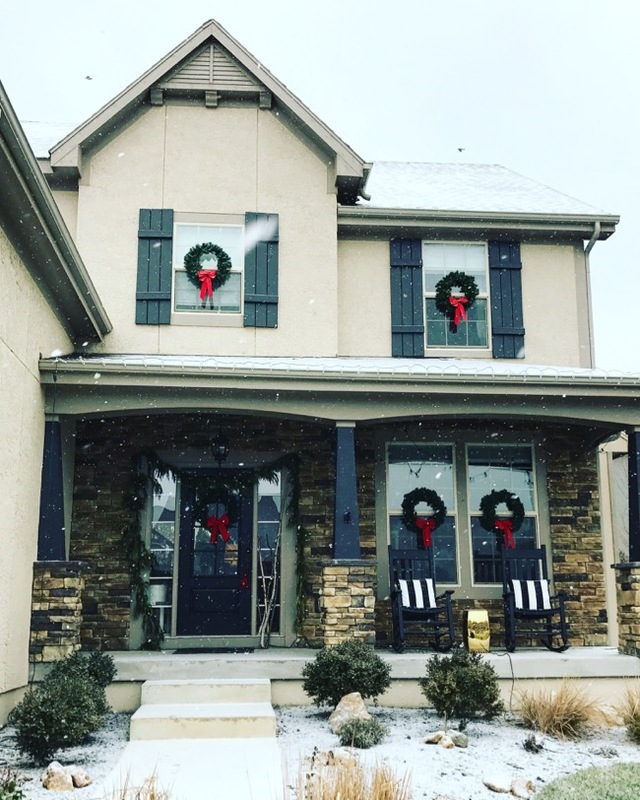 A separate post to come all about our trip, but for now I wanted to share the exterior of our home all decked out for Christmas! 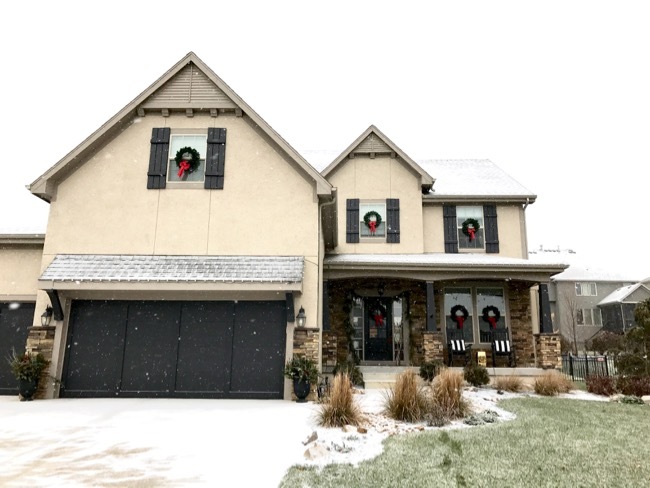 I was actually able to capture a few photos when we had a little snow this past weekend! 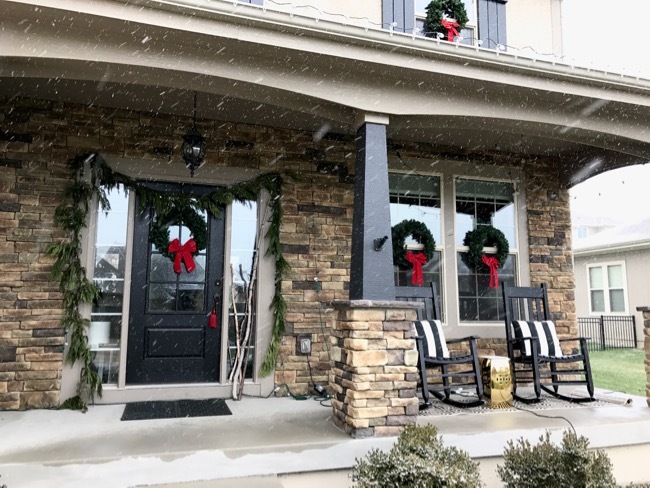 It's supposed to be 60 degrees on Christmas day here, so this is about as festive as it's going to get as far as the snow goes! 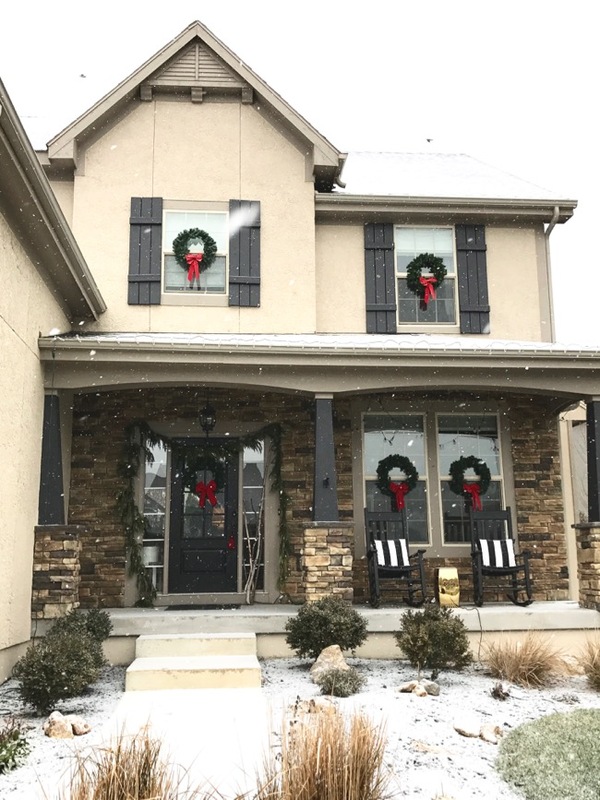 I decided I wanted to do something classic this year with our home, so wreaths on every window for the win! I absolutely LOVE this look and will be doing it every year! Steve is the real MVP here. I have the vision, Steve executes! The wreaths are all hung from Command Hooks, the kind with a metal hook. We cleaned the window with alcohol before adhering the strips. The wreaths have a metal base, so they are easy to hook right onto the Command Hooks. We have had not one issue with them falling down. 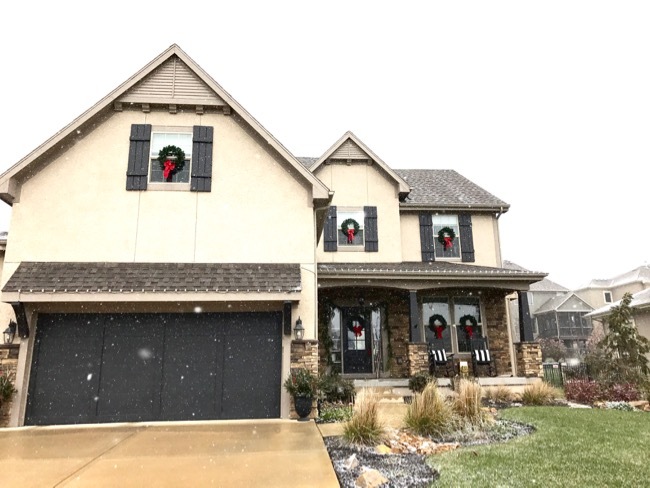 We have crazy winds here in Kansas and have also had a few rainfalls, and these wreaths are hanging tough! The wreaths are cheapies from Hobby Lobby. I think they were $5 each since all of their Christmas stuff is always 50% off. Why not just price everything the cheaper price?? I will never understand it! Anyway, the red bows are really what make these wreaths pop, and they are also cheapies from HL. I think I paid less than $2 each for one. Now that I've made the small investment, I will have them every year. 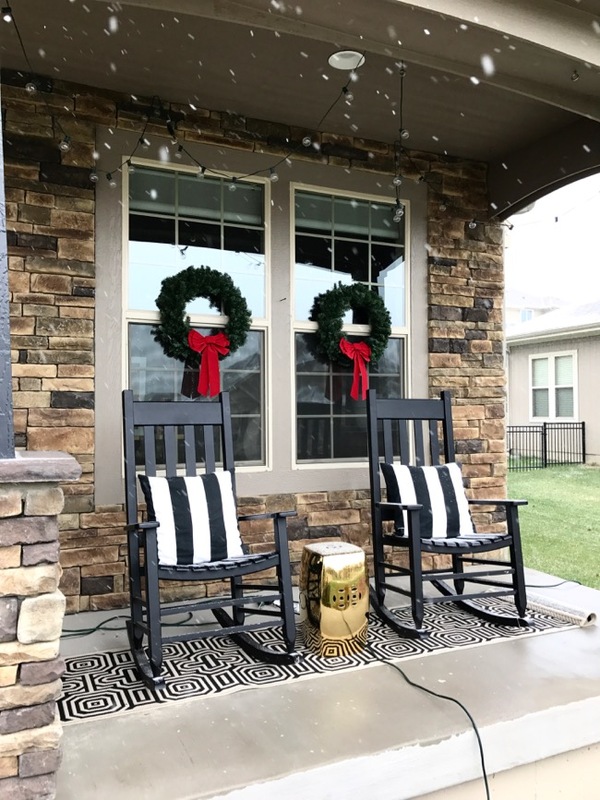 I decided to leave the rockers out this year since we never really seem to get that much snow. I'm sure I just jinxed it, but that's okay, my kids want to sled this year!!! The black and white pillows are cheap covers from IKEA. They are not outdoor pillows, but they are washable. I rectify them not being "outdoor" by stuffing outdoor pillows as the inserts so they never get moldy! It's my favorite hack. The gold garden stool is from Homegoods from a few years ago. The touch of gold is nice this time of year, or always in my book! I have a thing for fresh garland this time of year. I buy this at either Costco or Home Depot. 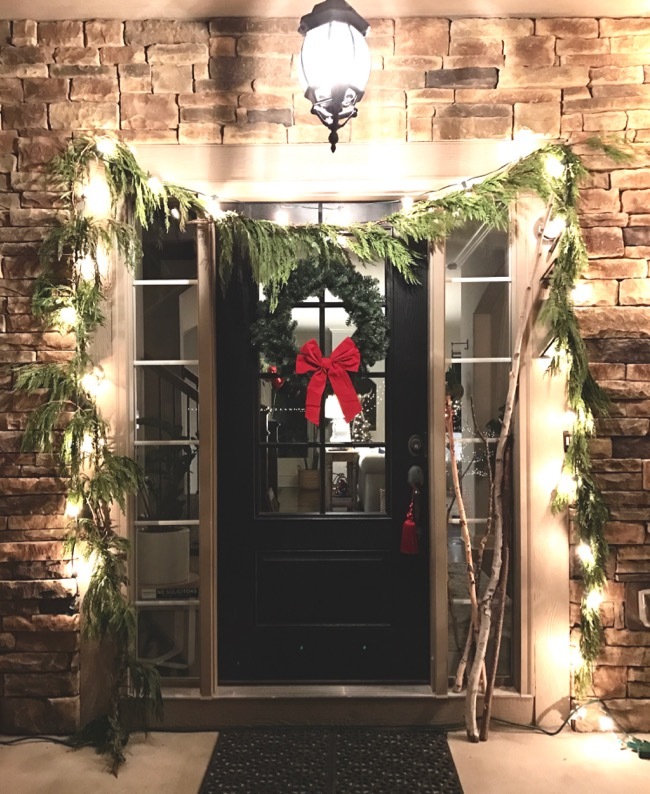 It's easy to string around the door and it is just so classic looking, I love it. 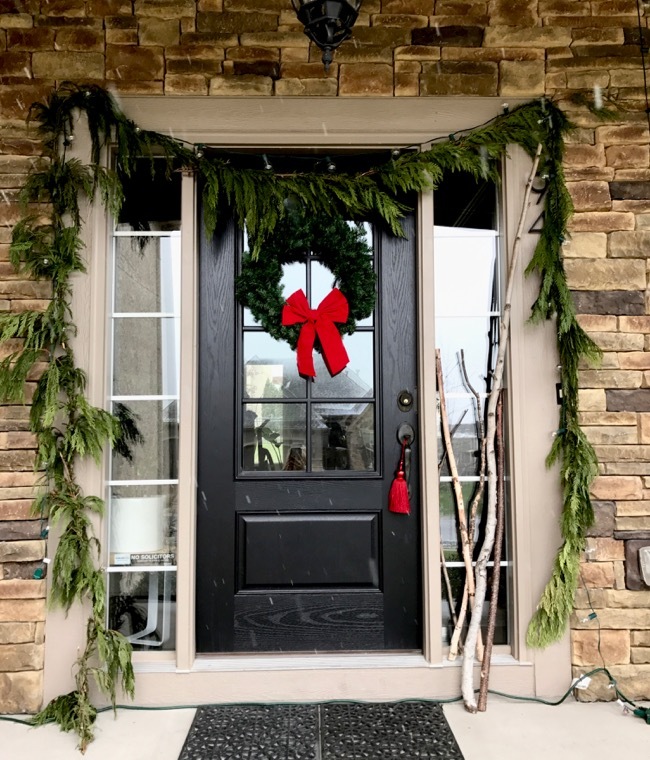 I kept the wreath on the door the same as the windows, added a red tassel on the door handle, and some birch sticks to complete this simple look. We placed a strand of string lights around the garland to light it up at night. The string lights add more punch with the large bulbs than regular Christmas lights. 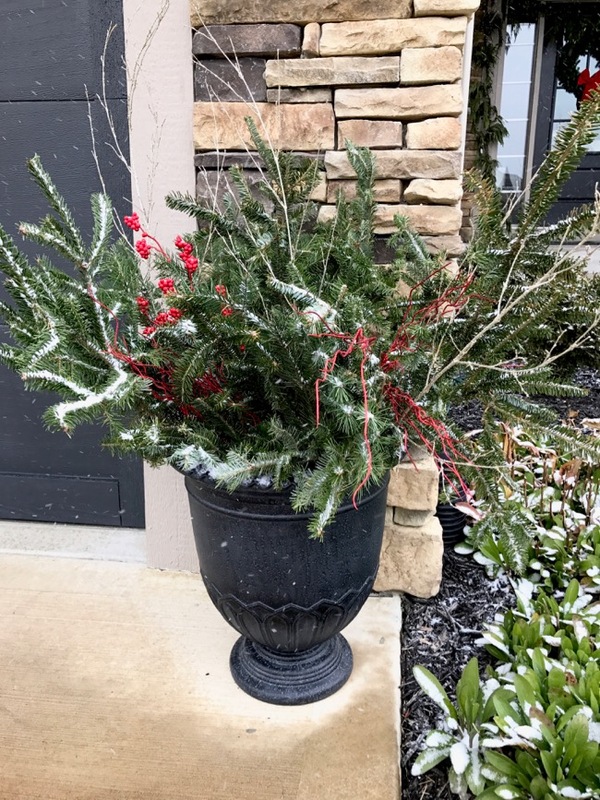 I also made some DIY outdoor containers using tree trimmings and some red/gold/silver sticks shoved in our black urns. I made two and they flank the garage doors. Can't do much better than free, right?! I made some of these last year too! You just can't go wrong with a classic look for Christmas!